It was a beautiful summer night in mid-June in Paris, France. It was nearly 11pm on the clock, and the sun just recently set. 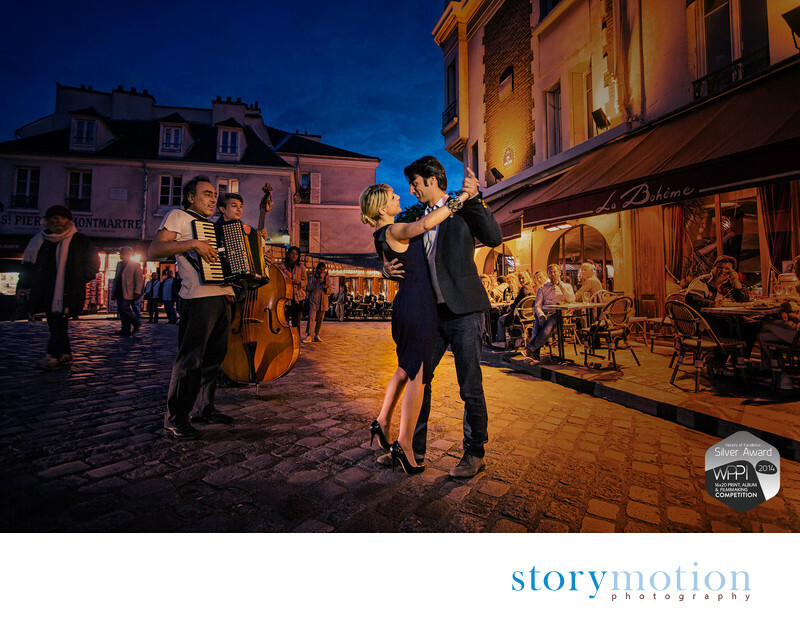 The streets of Montmartre were full of tourists walking along the streets and sitting at outdoor tables of many cafes, illuminated by the golden glow of the street lights. The sky at dusk was beautiful royal blue color. Alex, the embodiment of elegant and stylish Parisian woman, along with her handsome husband Laurent accompanied us on that beautiful night. As we passed the restaurant, street musicians just packed their instruments and were about to leave. Arthur rushed after them and asked to play just a bit more. As they played on, Alex and Laurent span around and giggled. The entire square stopped to watch them, some tourists even took photos. To this day this photo is one of our all-time-favorites, as it reminds us of our wonderful trip and that night. There is so much that we love about this photo -- the colors, couple's expression, the bystanders watching them, and even an artist rushing off on his business across the square. Maybe because of the post production work, or maybe because of the coloring of the image, viewers often mistake this photograph for a painting. Katya is very proud to have this image as her first award-winning photograph. This photograph became Award of Excellence Winner at WPPI (Wedding and Portrait Photographers International) Annual 16x20 Print, Album and Filmmaking Competition, Photography's Leading Album and Print Competition, in "Bride and Groom Together, Non-Wedding Day" category. Location: Place du Tertre, Paris, France.